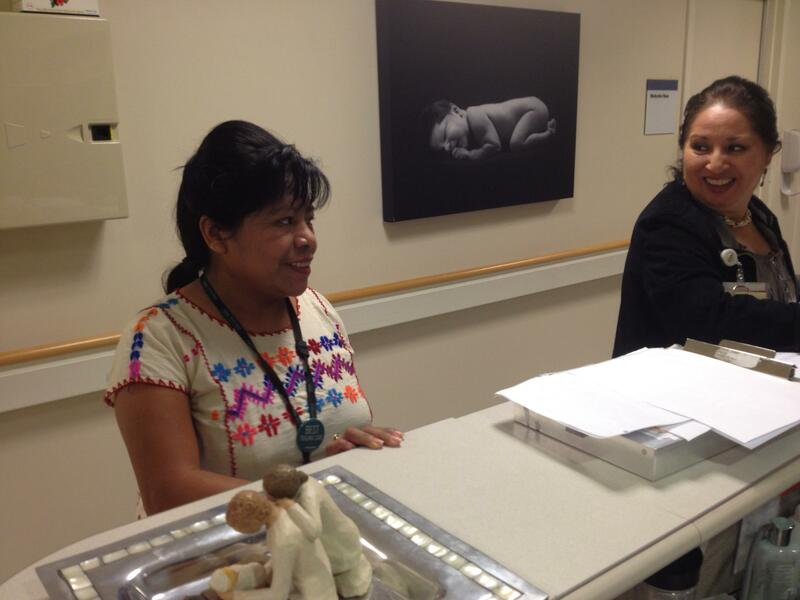 Mixteco Interpreter Angelica Isidro stops at a nurse's station at Natividad Medical Center. 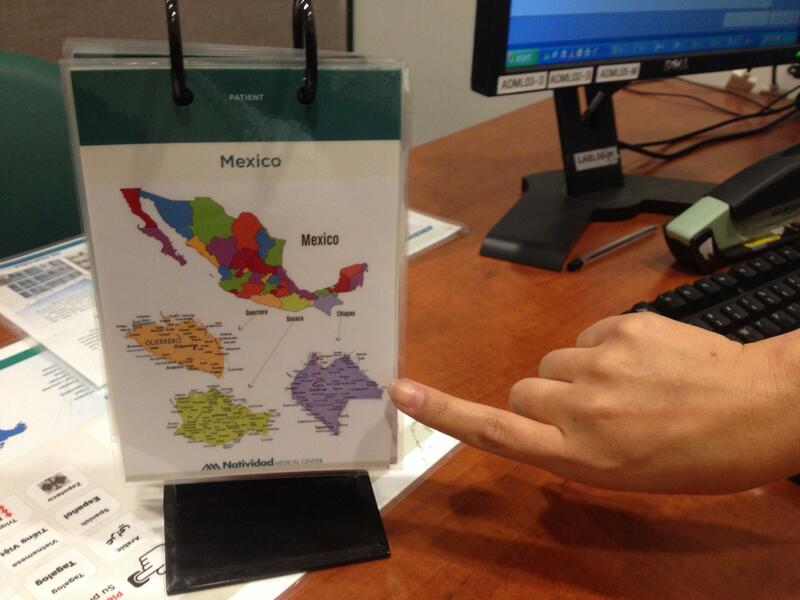 By using this map of Mexico, Natividad Medical Center staff can determine what kind of interpreter their patients need. Natividad Medical Center in Salinas is seeing a growing number of patients who only speak indigenous languages from Mexico and Central America. The hospital’s solution is an indigenous interpreting program that has been helping patients and doctors at the hospital, and is now available to hospitals and agencies across the nation. Sitting in his office at Natividad Medical Center, Victor Sosa scrolls through a spreadsheet listing the indigenous interpreters he has on call, and the languages they speak including Zapotec, Chatino and Quiche. For ten languages, he has more than 100 interpreters. That’s because within these languages there are variations. “We have to identify township and the districto they’re from because we have to get the right variant. If it’s different enough they won’t understand each other,” said Sosa, Language Access Coordinator at Nativdad. Since this interpreting program was launched about three years ago, the number of indigenous interpretations has consistently gone up. The hospital now does more than 100 a month. Mixteco is the most common language, followed by Triqui, another indigenous language from Mexico. “They’re not a huge percentage of our population, but they impact us greatly when they come in,” said Dr. Peter Chandler, OBGYN and Chief of Staff at Natividad. Dr. Chandler is one of the doctors who pushed for an indigenous interpreting program. He says the breaking point was when he had a Mixteco speaking patient who needed an emergency cesarean section, but refused. “So they ended up having to get other consultation from people in their community. And that took time. Luckily everything turned out okay, but it is very intimidating and it makes our job very difficult,” said Dr. Chandler. It’s a frustration felt beyond the hospital. “We began to get calls from other areas from the county, here locally, from social services, government agencies, state agencies and the nature of the calls were that they had a pressing need for an interpreter, but didn’t know where to go to find an interpreter,” said Sosa. So this month Natividad re-launched its program, now called Indigenous Interpreting Plus. The service remains free to its patients. But for a fee, Natividad is offering its network of interpreters and interpreter training to hospitals and agencies across the nation. “We have worked with them twice now since they’ve officially become Indigenous Interpreting Plus,” said Maureen Keffer, Indigenous Program Director at California Rural Legal Assistance in Oakland. She says CRLA has worked with indigenous farmworkers from Mexico for decades. And while they have their own indigenous language speakers on staff, she still sees a great need for this service. “I think that for decades really agencies have been treating indigenous language speakers as if they were Spanish speakers. And then being really kind of surprised or disappointed when they are not communicating well,” said Keffer. “I think it is very important for the community,” said Angelica Isidro. She is a Mixteco Interpreter at Natividad and Co-Founder with Victor Sosa of Indigenous Interpreting Plus. She says it’s important for her community, “that they understand when they come to the hospital what is wrong with them. That’s very, very important that when they leave, they leave happy that they were treated well. They were looked after,” said Isidro. Right now the Natividad Medical Foundation is funding Indigenous Interpreting Plus through community donations, including contributions from Driscoll’s and the Agricultural Leadership Council. But the hope is the fees will eventually be enough to support the program. More than four million California residents were born in Mexico, so the state has a lot of experience with students learning English as a second language. In Watsonville, though, public schools have struggled to educate a growing number of Mexican students from indigenous backgrounds: it’s a little bit trickier when English is your third language.